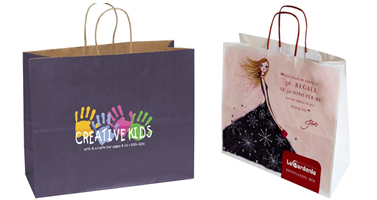 White kraft paper bags are great as promotional bags,colorful,stylish,elegant are benefits of white kraft paper bags with full colors printing.With twisted handles,it is the cost effective way to build promotional bags.Any size is available to fit your products and service. 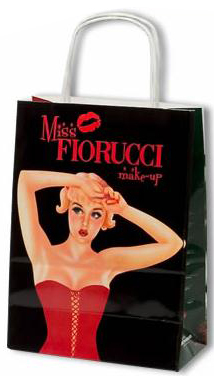 White kraft bags with full colors printing,feature with black twisted handles.In fact twisted handles are available in any color,that can make kraft paper bags personalized to suit business brand.16 x 6 x 13"
Full colors printing kraft bags with colored twisted handles,feature with inside printing,great way to create personalized paper bags for promotion in cost effective way.Because of its economy,they are favored as promotional bags and shopping bags. Paper Bags Direct used offset printing to print any color on kraft paper bags,whether they are photographic image or pantone colors,we can print on kraft bags perfectly.Any quantity is acceptable,whether you are looking for 250 pcs for conference,sale event,or 100,000 pcs for chain retail ,you can get great competitive price from Paper Bags Direct. 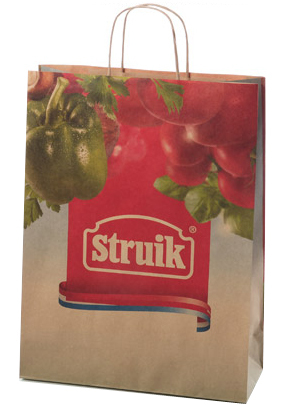 We list prices for some popular sizes white kraft paper bags with full colors printing for your reference.